Now we would like to introduce our instructors and key people in our club. All of our instructors are qualified in First Aid and hold a blue Card from the Commission for Children and Young People and Child Guardian. This is us… come and join us! 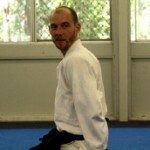 Rod Nixon-Smith Sensei (4th dan) is our head instructor at Everton Hills dojo. “I am fascinated to find that the longer my practice continues, the more I learn about the art. Having made many mistakes over the years I enjoy passing on the benefit of my experience to newer students to save them all a lot of time.” Rod Sensei holds dan grades in the Ki Society as well as Aikido Yuishinkai, is an aikido seminar regular at home and overseas. For many years Rod’s main interest was Athletics where his pet event was the 800 metres, reaching international competition standard. Realising that he was losing speed and that running away from bad situations was no longer an option, Rod turned to Aikido as a means of self-defence, which was recommended to him by one of his Judo instructors. Steve Dows Sensei (6th Dan) teaches a monthly seniors class at Nathan. He is also our club President. Originally a student of Brian Powers Sensei, he joined Ki Society and Maruyama Sensei sometime in the early eighties we think. 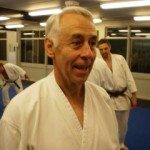 Some remember him teaching at Spring Hill and Coorparoo prior to joining Griffith Aikido. Steve teaches Ki on a regular basis. His classes are refreshing as he always returns to the basics, which can all too quickly be forgotten. He often focuses on basic movements with or without weapon in hand. He is noted for his strong Ki extension and the relaxed power he generates. 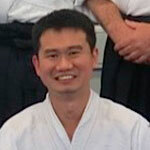 Ben Tan Sensei (3rd Dan) is our Nathan Dojo Cho and teaches the Saturday morning adult class. Ben sensei started Aikido during a short research stint in Christchurch, NZ. It was there that he first heard about this so called ‘Aikido’ martial art; something Ben had very limited knowledge of but was keen to find out more about. At his first lesson he found that he felt as though he had two left feet, and limbs that seem to have minds of their own which just couldn’t mimic sensei’s movements. Upon returning from his NZ trip and all gung-ho about continuing Aikido, he joined the Griffith Aikido Club in 2003. Starting off with just 2 classes per week, and then to 3 and finally to 5 classes a week, he was soon hooked. Michael Karkkainen Sensei (5th Dan). Michael teaches at our club every second Tuesday evening. Sensei has been practising Aikido for over 20 years. Michael began his Aikido training at Griffith Aikido (formerly Griffith University Aikido Club) under Michael Williams Sensei in 1985, just before Mauyama Sensei’s first trip to Australia. Michael helped Williams Sensei run weekend workshop classes in Byron Bay which were such a success that, Williams Sensei went on to be a full time Aikido instructor. 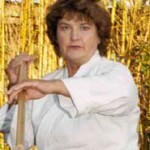 Williams Sensei asked Michael to follow him in relocating to Buron Bay to help set up the club there. 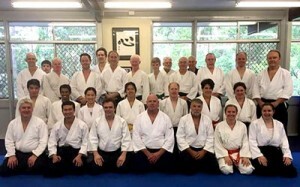 After several temporary dojos, they were finally able to build ‘Goshin-kan’ which was opened by Maruyama Sensei in 1991 and until recently, served as the headquarters of Aikido Yuishinkai Australia. In 2005, Michael moved to Adelaide and began training with John Ward Sensei and eventually began co-teaching with Ward Sensei at the club in Unley. 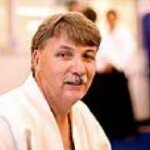 In 2009, Michael returned to Brisbane and began training at Cleveland Aikido with Thom Hansen Sensei. He still teaches there once a month and we consider ourselves fortunate to have Michael teaching regularly at Griffith Aikido. 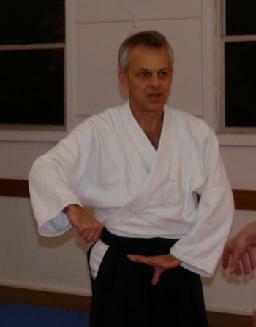 Paul Crawley Sensei (2nd Dan) teaches every second Tuesday night at Nathan dojo. Originally from Brisbane, Paul began practicing aikido at Byron Bay in 2002, returning home and training with the Griffith aikido club in 2005. Paul has a particular interest in practicing ukemi; the falling arts in aikido. While traveling and training in Brazil he had the opportunity to learn some advanced soft fall methods which he enjoys teaching in class whenever he can. Outside the dojo Paul spends his time working as a remedial massage therapist. 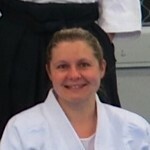 Narelle Campbell is one of our Shodans who has proved to be a great example for young women in martial arts. Narelle teachs every other Thursday evening. From time to time she also organises self defence classes for females. Narelle is also the club Treasurer, responsible for the club’s finances. When not practicing Aikido or attending to administration, Narelle spends time with her new puppy Kira.